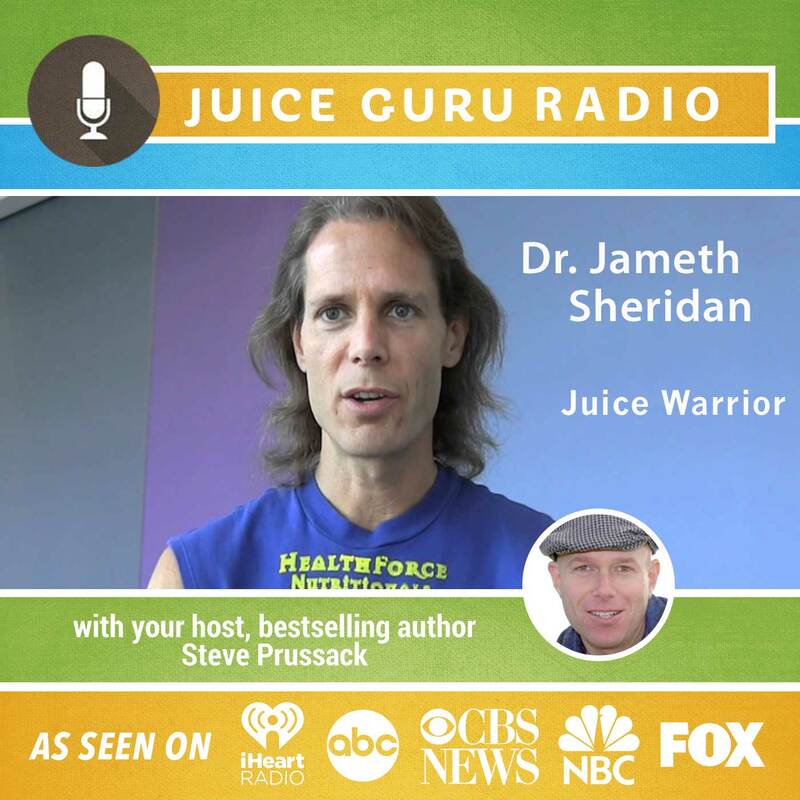 Our show features an exclusive interview with health and juicing warrior Dr. Jameth Sheridan. The truth about juice fasting; is it healthy? Dr. Jameth Sheridan serves on the medical advisory board for the Juice Guru Certification Program. He wrote the foreword to “The Complete Idiot’s Guide to Juice Fasting.” Doctor of Holistic Medicine, Naturopath and Hard-Core Natural Medicine Researcher, Dr. Sheridan is one of the early pioneers of the vegan, organic, holistic, and raw foods movements. As of 2011, he has been immersed in holistic health for 27 years, veganism for 25 years, and raw foods for 24 years. Dr. Jameth Sheridan is the co-founder of HealthForce Nutritionals, which over the past 20 years has become one of the premier superfood and alternative medicine companies in the world, providing extreme quality and value bio-compatible nutritional superfoods internationally, including to people with life threatening conditions. Some of his most well known formulas are Vitamineral™ Green, Vitamineral Earth™ and the HealthForce Healing Cleanse™. Other companies constantly seek out his unique formulation and product production expertise. He only agrees to a select few whose standards are high enough.